Every year at this time the Earth sweeps through the stream of meteoroids released by Comet 109P/Swift-Tuttle which passed just inside the Earth’s orbit in 1992 and is not due to return until 2126. And every year at this time, some of those meteoroids plunge into our upper atmosphere at 59 km per second, producing a rich display of bright meteors, many leaving glowing trains in their wake. According to some claims, this year’s meteor spectacle could be even better than usual. The meteors appear in all parts of the sky but, since they are moving in parallel, perspective causes their paths to point away from a so-called radiant point in the constellation Perseus. It has already been active for a week, but it is expected to peak at about 13:00 BST on the 12th when, typically, an observer beneath the radiant and with a perfect dark sky might count 80 or more Perseids per hour. Of course, this year’s peak occurs in daylight for Scotland, but we should still enjoy high rates on our nights of 11/12th and 12/13th. The radiant, plotted on our north star map, stands in the north-east at nightfall and climbs to lie just east of overhead before dawn. As the radiant climbs, so we face more directly into the Perseids stream and meteor rates climb in sympathy. This means that our morning hours are favoured and we have the extra advantage that the Moon sets in the middle of the night on the critical nights, though moonlight will hinder evening watches. Another bonus is that the nights are much less cold than they are for the year’s other two major showers which occur in the depths of winter. The suggestions that the Perseids might be particularly active in 2016, with perhaps twice as many meteors as usual, derive from the fact that Jupiter approaches the Perseids stream every 12 years and its gravity might be diverting a segment of the stream closer to the Earth on each encounter. Indeed, there does seem to be a 12-years periodicity in enhanced Perseids displays with the last one in 2004, so we may be due for another special show this month. Sunrise/sunset times for Edinburgh change from 05:17/21:19 BST on the 1st to 06:16/20:09 on the 31st. The Moon is new on the 2nd, at first quarter on the 10th, full on the 18th and at last quarter on the 25th. 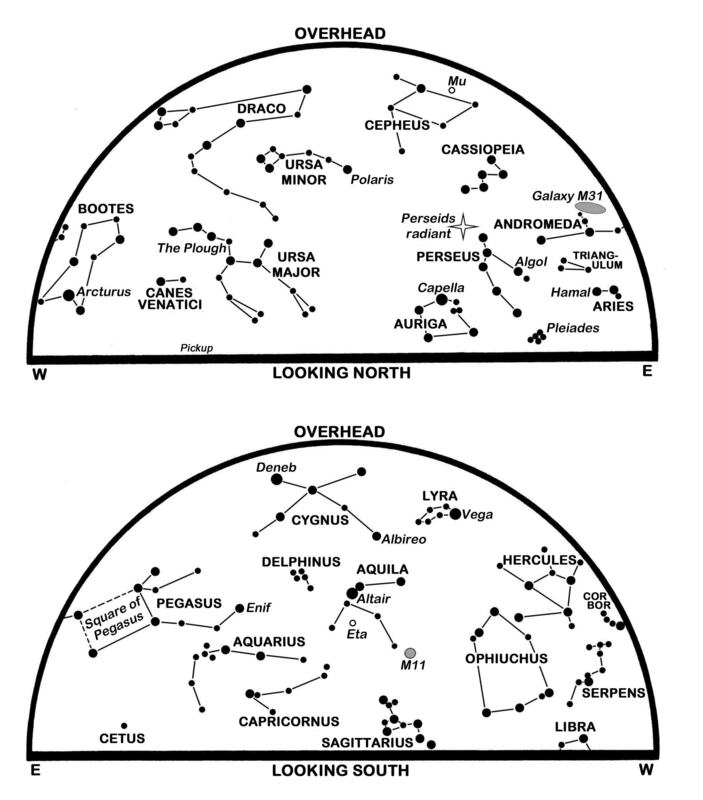 Our chart depicts the Summer Triangle, formed by Deneb, Vega and Altair, high on the meridian as the Plough sinks in the north-west and the “W” of Cassiopeia climbs in the north-east, above the Perseids radiant. The large but rather empty Square of Pegasus balances on a corner in the east-south-east while the Teapot of Sagittarius is toppling westwards on our southern horizon. To its right, and very low in the south-west, is Saturn, the only bright planet visible at our map times. Saturn hardly moves this month, being stationary against the stars on the 13th when it reverses from westerly to easterly in motion. It lies in Ophiuchus, 6° north of the red supergiant star Antares in Scorpius. Antares is around magnitude 1.0 while Saturn is almost twice as bright at 0.4. Saturn stands above Antares low in the south-south-west as tonight’s twilight fades but are outshone by the Red Planet, Mars, which lies 10° to their right and is three times brighter than Saturn at magnitude -0.8. Mars, though, is moving eastwards (to the left) at almost a Moon’s-breadth each day and passes between Antares and Saturn, and 1.8° above Antares, on the 24th. Even though Mars dims to magnitude -0.4 by then, it remains much brighter than Antares even though the star’s name comes from the Ancient Greek for “equal to Mars”. Both appear reddish, of course, but for very different reasons – Antares has a bloated “cool” gaseous surface that glows red at about 3,100°C while Mars has a rocky surface which is rich in iron oxide, better known as rust. The Moon stands above-right of Mars and to the left of Saturn on the 11th when Mars appears only 12 arcseconds wide if viewed through a telescope. Saturn is 17 arcseconds across while its rings span 39 arcseconds and have their north face tipped 26° towards us. By the 31st, Mars has faded further to magnitude -0.3 and lies 4° above-left of Antares. Observers at our northern latitudes must work hard to spot any other bright planet this month although anyone in the southern hemisphere can enjoy a spectacular trio of them low in the west at nightfall. Seen from Scotland, though, the brilliant (magnitude -3.9) evening star Venus stands barely 5° above our western horizon at sunset and sets itself less than 40 minutes later. We need a pristine western outlook to see it, and quite possibly binoculars to glimpse it against the twilight. Fainter (magnitude -1.7) is Jupiter which stands currently 27° to the left of Venus and 5° higher so that it sets more than 70 minutes after the Sun. Between them, and considerably fainter, is Mercury which stands furthest from the Sun (27°) on the 16th and, perhaps surprisingly, is enjoying its best evening apparition of the year as seen from the southern hemisphere. Jupiter sinks lower with each evening and meets Venus on the 27th when Venus passes less than 5 arcminutes north of Jupiter. This is the closest planetary conjunction of the year and would be spectacular were the two not so twilight-bound. As it is, binoculars might show Jupiter 9 arcminutes below and left of Venus on that evening. This is a slightly-revised version of Alan’s article published in The Scotsman on August 1st 2016, with thanks to the newspaper for permission to republish here. The revelations by New Horizons at Pluto were certainly the highlight for July, showing that even small ice-bound worlds far from the Sun can have an active and fascinating geology. No doubt we are in for further surprises as the data from the encounter are downloaded over the narrow-bandwidth link to the probe over the coming months. August sees our attention return to Comet 67P/Churyumov–Gerasimenko which is due to experience its peak activity as it sweeps through perihelion, its closest to the Sun, on the 15th. We should enjoy a grandstand view courtesy of Europe’s Rosetta probe in orbit around the comet’s icy nucleus, but it is far from certain that Philae will be able to relay further measurements from the surface. The comet’s perihelion occurs 26 million km outside the Earth’s orbit so none of the icy debris being driven from its nucleus is destined to reach the Earth. The Earth does, though, intersect the orbit of Comet 109P/Swift-Tuttle with the result that its debris or meteoroids plunge into the upper atmosphere to produce the annual Perseids meteor shower. Its meteors diverge from a radiant point in Perseus which lies in the north-east at our star map times and climbs to stand just east of the zenith before dawn. Note that the shower’s meteors appear in all parts of the sky, with many of them bright and leaving persistent trains in their wake as they disintegrate at 59 km per second. 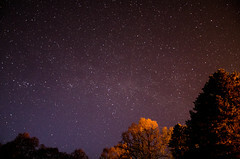 According to the British Astronomical Association (BAA), the premiere organisation for amateur astronomers in Britain, the shower is active from July 23 until August 20 and, for an observer under ideal conditions, reaches a peak of 80 or more meteors per hour at about 07:00 on the 13th. This is obviously after our daybreak, but rates should be high throughout the night of the 12th-13th and particularly before dawn, and respectable on the preceding and following nights too. With the Moon new on the 14th and causing no interference, the BAA puts the Perseids’ prospects this year as very favourable, an accolade it shares with the Geminids shower in December. The Sun dips 10° southwards during August as sunrise/sunset times for Edinburgh change from 05:16/21:21 BST on the 1st to 06:14/20:11 on the 31st. The duration of nautical twilight at dawn and dusk shrinks from 121 to 89 minutes. The Moon is at first quarter on the 7th, new on the 14th, at first quarter on the 22nd and full again on the 29th. After the twilit nights during the weeks around the solstice, August should bring (if the weather ever improves!) a chance to reacquaint ourselves with the best of what the summer skies can offer. The Summer Triangle formed by Vega in Lyra, Deneb in Cygnus and Altair in Aquila stands high in the south at our star map times, somewhat squashed by the map projection used. After the Moon leaves the scene, look for the Milky Way as it flows diagonally through the Triangle, its mid-line passing between Altair and Vega and close to Deneb as it arches over the sky from the south-south-west towards Cassiopeia, Perseus and Auriga in the north-east. The main stars of Cygnus the Swan are sometimes called the Northern Cross, particularly when the cross appears to stand upright in our north-western sky later in the year. The Swan’s neck stretches south-westwards from Sadr to Albireo, the beak, which is one of the finest double stars in the sky. A challenge for binoculars, almost any telescope shows Albireo as a contracting pair of golden and bluish stars. The brightest star on the line between Sadr and Albireo is usually the magnitude 3.9 Eta. 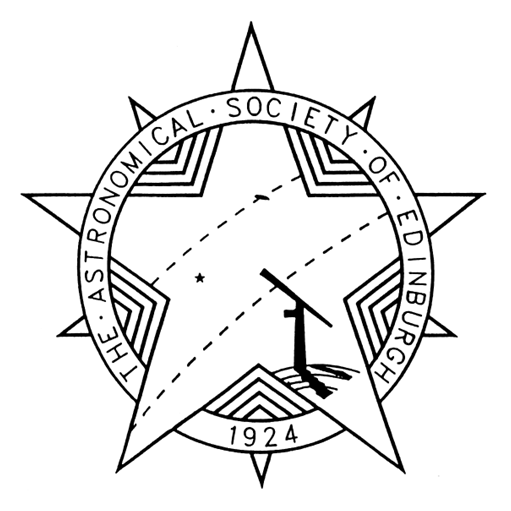 However, just 2.5° south-west of Eta is the star Chi Cygni which pulsates in brightness every 407 days or so and belongs to the class of red giant variable stars that includes Mira in Cetus. Chi is a dim telescopic object at its faintest, but it can become easily visible to the naked eye at its brightest. Last year, though, it only reached magnitude 6.5, barely visible to the naked eye. Now approaching maximum brightness again and as bright as magnitude 4.2 in late July, it may surpass Eta early in August, so is worth a look. Venus and Jupiter have dominated our evening sky over recent months but are now lost in the Sun’s glare to leave Saturn as our only bright planet as the night begins. Although it dims slightly from magnitude 0.4 to 0.6, it remains the brightest object low down in the south-west as the twilight fades. Indeed, it stands only 5° or so above Edinburgh’s horizon at the end of nautical twilight and sets thirty minutes after our map times, so is now poorly placed for telescopic study. Catch it 2° below-right of the first quarter Moon on the 22nd when Saturn’s rings are tipped at 24° and span 38 arcseconds around its 17 arcseconds disk. Jupiter reaches conjunction on the Sun’s far side on the 26th while Venus sweeps around the Sun’s near side on the 15th and reappears before dawn a few days later. Brilliant at magnitude -4.2, its height above Edinburgh’s eastern at sunrise doubles from 6° on the 25th to 12° by the 31st. Also emerging in our morning twilight is the much dimmer planet Mars, magnitude 1.8. On the 20th and 21st it rises in the north-east two hours before the Sun and lies against the Praesepe or Beehive star cluster in Cancer. Before dawn on the 31st, Mars stands 9° above-left of Venus. This is a slightly-revised version of Alan’s article published in The Scotsman on July 31st 2015, with thanks to the newspaper for permission to republish here. Our usual highlight for August is the return of the prolific and reliable Perseids meteor shower. Unfortunately, meteor-watchers have to contend with moonlight this year and it is just as well that we have other highlights as compensation. Foremost among them is the closest conjunction between Venus and Jupiter, the two brightest planets, since 2000 though they are low down in our morning twilight. Mars and Saturn rendezvous, too, and we have our best supermoon of the year. Sunrise/sunset times for Edinburgh change from 05:17/21:20 BST on the 1st to 06:15/20:10 on the 31st. The spell of nautical twilight at dusk and dawn shrinks from 121 to 89 minutes. The Moon is at first quarter on the 4th, full on the 10th (see below), at last quarter on the 17th and new on the 25th. The term supermoon has gained currency in recent years to describe a full moon that occurs when the Moon is near its closest in its monthly orbit. At such times, it can appear 7% wider and 15% brighter than an average full moon. In my view, the enhancement is barely perceptible to the eye and is less impressive than the illusion that always makes the Moon appear larger when it is near the horizon. As the media have discovered, though, supermoons provide a good excuse to feature attractive images of the Moon against a variety of landscapes, and if this encourages more people into astrophotography, so much the better. This month, the Moon is full at 19:10 BST on the 10th, less than 30 minutes after its closest point (perigee) for the whole of 2014. On that evening, the supermoon is already 4° high in the east-south-east as the Sun sets for Edinburgh, so judge (and photograph?) for yourself. Venus is brilliant at magnitude -3.9 as a morning star. Rising at Edinburgh’s north-eastern horizon at 03:10 BST on the 1st, it stands 15° high in the east-north-east at sunrise. By the 31st, it rises at 04:42 and is 12° high at sunrise. Between these dates it is caught and passed by Jupiter which emerges from the twilight below and to Venus’ left on about the 7th and stands only 0.2° below Venus before dawn on the 18th. Jupiter is magnitude -1.8, one seventh as bright as Venus, but still outshines every star so the conjunction is a spectacular one, albeit at an inconvenient time of the night. 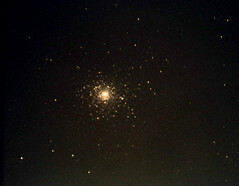 In fact, the event occurs less than a degree south-west of the Praesepe or Beehive star cluster in Cancer, but this may be hard to spot in the twilight. Before dawn on the 23rd, the two planets lie to the left of the waning and brightly earthlit Moon. By the month’s end, Jupiter rises by 03:25 and stands 13° above-right of Venus. Mars and Saturn have set by the map times but stand low in the south-west as our evening twilight fades. On the 1st, Mars is magnitude 0.4 and lies 10° to the left of Spica in Virgo. Saturn, only a little dimmer at magnitude 0.5 in Libra, is 13° to Mars’ left, and slightly higher. Look for the Moon to the right of Mars on the 2nd, between Mars and Saturn on the 3rd and to the left of Saturn on the 4th. Mars, meanwhile, tracks eastwards to cross from Virgo to Libra on the 10th and pass 3.5° below Saturn on the 24th. By the 31st, both planets have faded to magnitude 0.6, and Mars lies 5° below-left of Saturn with the Moon between them again and very close to Saturn. After passing around the Sun’s far side on the 8th, Mercury is too low to be seen in our evening twilight. Our chart depicts the bright stars Deneb, Vega and Altair high in our southern sky where they form the Summer Triangle. The centre of our Milky Way galaxy lies in Sagittarius on the south-south-western horizon but the Milky Way itself flows northwards through Aquila and Cygnus before tumbling down through Cepheus, Cassiopeia and Perseus in the north-north-east. 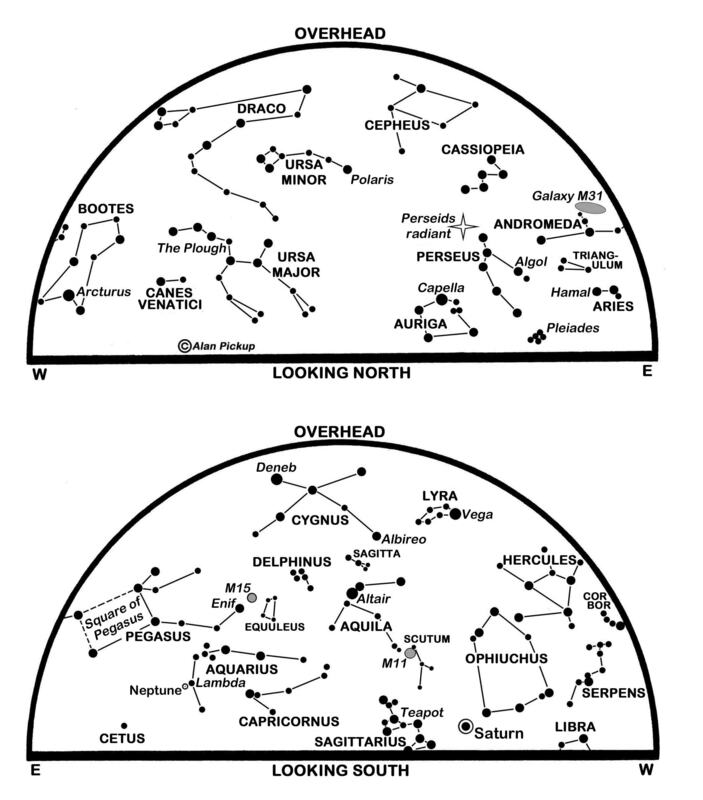 Use binoculars to seek out the star Mu Cephei high above familiar “W” of Cassiopeia. Dubbed the Garnet star by Sir William Herschel, Mu is one of the reddest stars we know and pulsates semi-regularly between magnitude 3.4 and 5.1. Some 6,000 light years away, it is so large that it would extend beyond the orbit of Saturn if it replaced the Sun and is sure to explode as a supernova within a few million years. The Perseids are due to peak in the middle of the night on 12-13th August when we might have been able to glimpse more than 80 meteors per hour under ideal conditions. As it is, bright moonlight will ensure that meteor counts are well down, though we can still expect some impressive bright meteors that leave persistent glowing streaks, called trains, in their wake. Decent rates may be seen from perhaps 10-15th August and, in fact, the shower is already underway as the Earth takes from 23 July to 20 August to traverse the stream of Perseid meteoroid particles laid down by Comet Swift-Tuttle. It is only appropriate that the resulting meteors are swift, too, as they disintegrate in the upper atmosphere at 59 km per second. 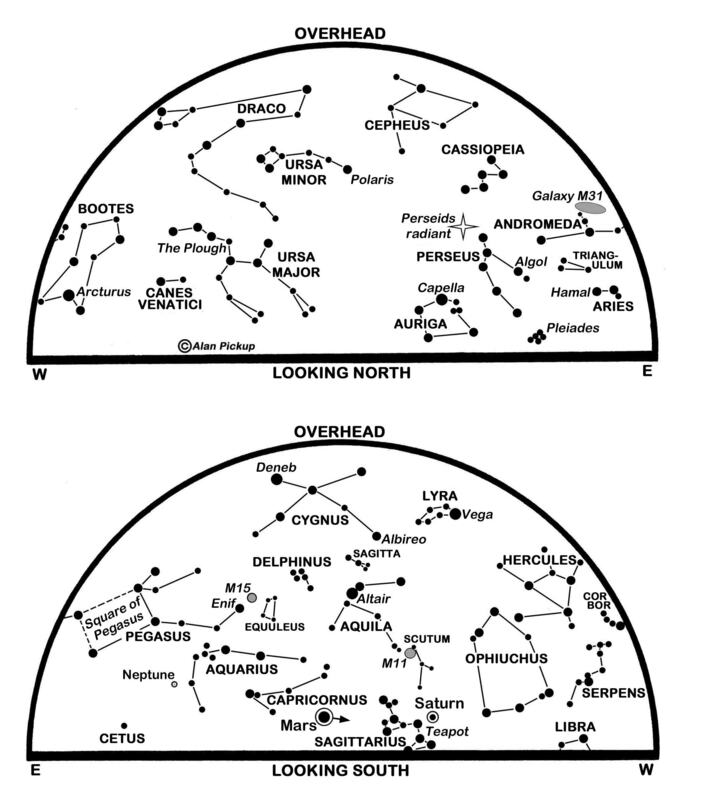 Although they move in parallel through space, perspective means that they appear to diverge from a radiant point in Perseus, plotted on our northern star map below Cassiopeia. That point climbs through the north-east overnight to approach the zenith by dawn, but remember that the meteors can appear in any part of the sky and not just towards the radiant. This is a slightly-revised version of Alan’s article published in The Scotsman on August 1st 2014, with thanks to the newspaper for permission to republish here.